In the past I really only decorated my mantel for Christmas. Sometimes I’d put up a little bunting or banner, or maybe a cute sign, for other holidays, but I usually only changed my mantel decor significantly around Christmas. But this year I had so much fun changing things up with my winter mantel decor, that I couldn’t resist changing it over for spring, too. 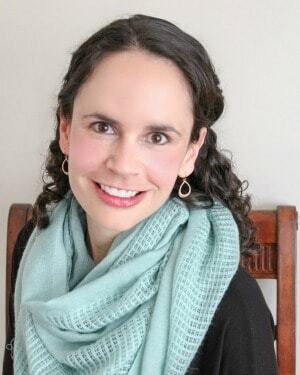 And when my friend Amy from My Life From Home invited me to share my spring mantel decorating ideas as part of a Spring Mantel Blog Hop, I knew it was meant to be! 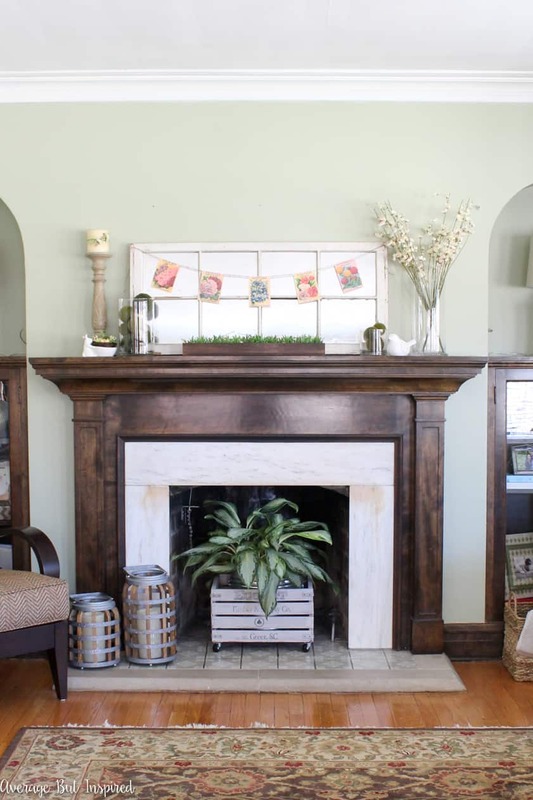 So without further ado, let me show you my spring mantel (and make sure to visit the other spring mantel decorating ideas you’ll find at the end of this post)! This post contains some affiliate links. To read my full disclosure policy, please click here. 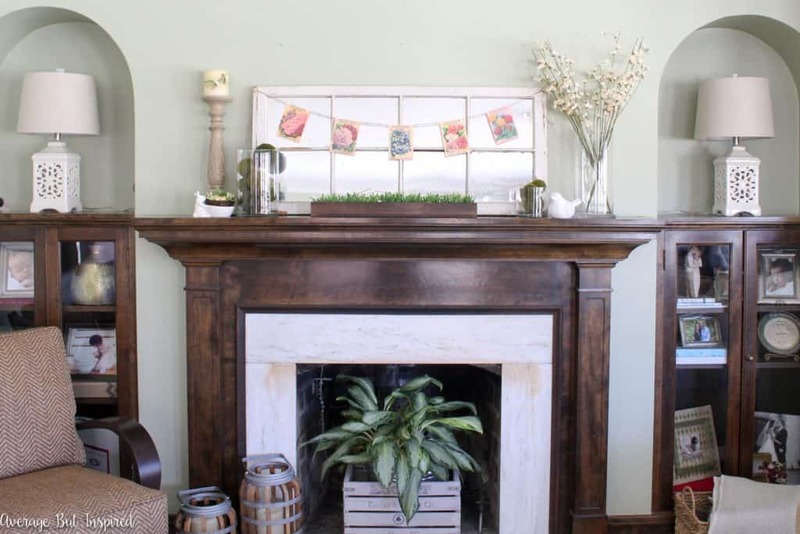 I went really green and really simple for my spring mantel, and I think it works! 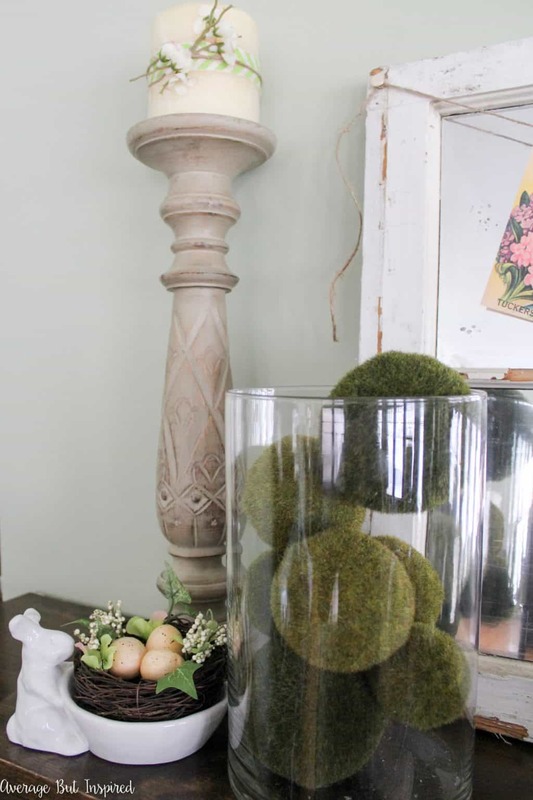 I tried hard to use things I already had, like moss-covered balls, white ceramic decor accents (like a bunny candy dish (here’s a similar one) and bird), a candlestick, and flowering cherry branches . . . and thankfully it all came together. One new purchase was the long planter box in the middle, which I filled with faux grass that I cut to size, and trimmings from the flowering cherry branches in the large vase. 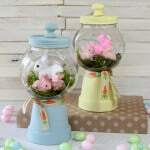 I also used some of those cherry blossom trimmings and a ribbon scrap to add a pop of spring to a plain candle. 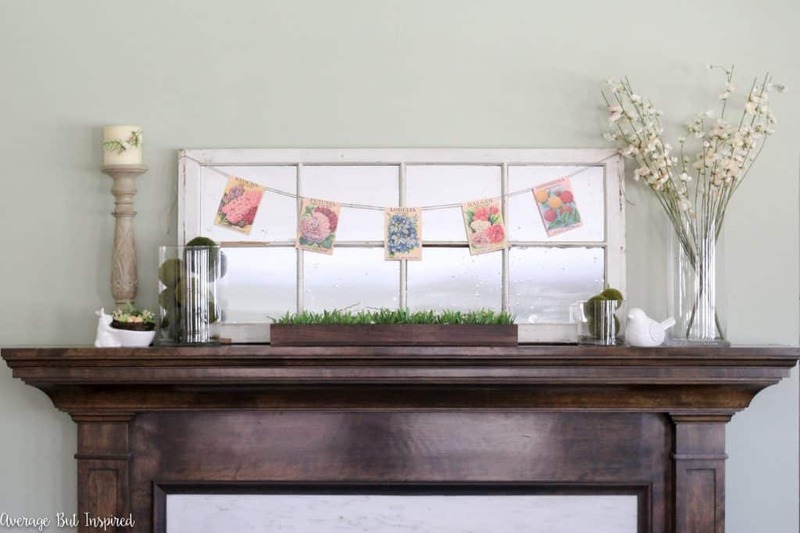 I think my favorite thing about my spring mantel is the vintage seed packet bunting that I made for over the window mirror. I’m going to let you in on a little secret . . . they’re not actually seed packets at all! They’re just some free printables that I downloaded from Knick of Time (THANK YOU, Angie! ), and resized to be smaller like seed packets. I glued them onto twine and had an adorable and “springy” bunting for my mirror! Now, this has nothing to do with my mantel, but when I was taking pictures I moved my coffee table out of the way . . . and my NEW little puppy decided to plop himself right in the middle of my workspace. I guess he wants you all to be formally introduced! So please meet Jasper, my 13 week old Labradoodle! 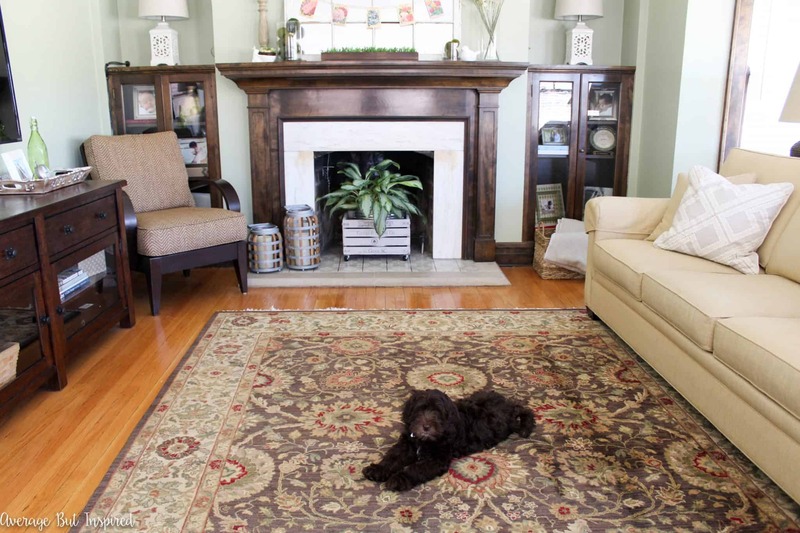 He told me he approves of my spring mantel decorating ideas, so I hope you do, too! 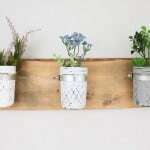 Now that you’ve seen how I added some spring decor to my mantel, please head over to my friends’ posts to see their gorgeous spring mantel decorating ideas, too! 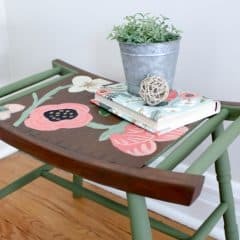 Creative Ways to Bring the Outdoors Inside! YOur mantel is so pretty and your puppy is ADORABLE! 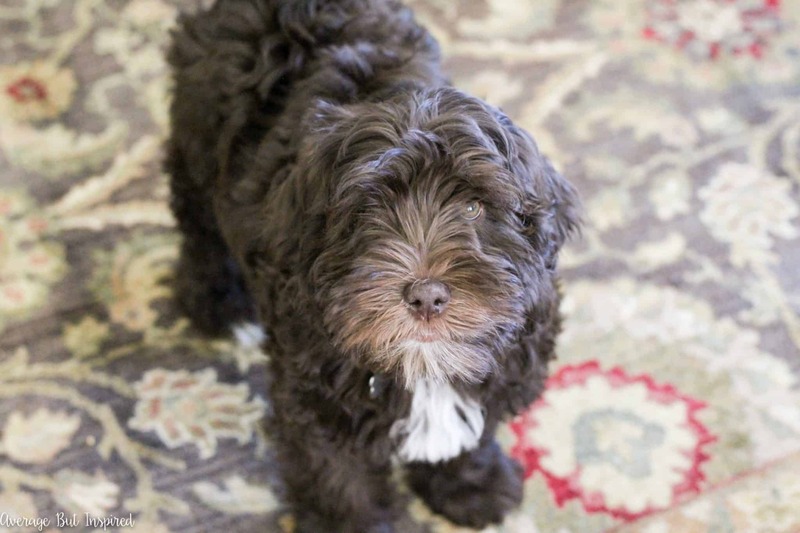 We have thought about a puppy and a labradoodle made the list. So cute! Beautiful, Bre! I love the addition of the seed packets on the window. I was thinking of doing the same thing, but ran out of time. I may still need to do that. It looks so cute. Thanks for joining in this hop! Now we just need the spring weather to come! I love what you did with the seed packets, so clever! 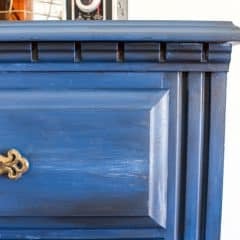 You mantel is gorgeous! Such a pretty mantel display, Bre. Love your new Labradoodle! I bet Jasper is loving his new home and family. Thanks for sharing. Hello Jasper! Yes, he is adorable:) I could use a little “spring” on my mantle today. Raining/sleeting with a vengeance right now. I’m sitting her sipping hot tea instead of thinking about spring bulbs. But I love the look you created. Funny how a ribbon around the candle makes such a huge difference – so pretty as always, Bre! Ok, that seed packet garland is amazing!! I might just need to make one too! I’m looking at my mantel and know just where I’d put it. 🙂 Your puppy is adorable – have fun with him! I love the use of the old window. It really makes the space feel special! 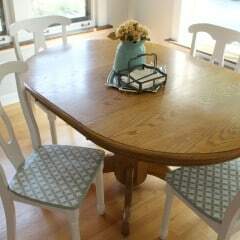 I think going simple and green is perfect for a Spring mantle!! Especially love the long planter box in the center. And the seed packet garland is amazing!! Those vintage seed packets are my favorite too! Its the first thing I saw. I need to find me some of those. Love the whole space! I love all your ideas Bre! Those printables that look like vintage seed packets are so cute…and your new pup is adorable! Oh my gosh, Bre, he’s ADORABLE! Hi Jasper! 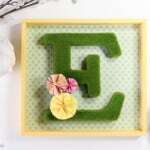 Where to start – I love your idea for the seed packet bunting – so cute and the faux grass. Even the moss balls look fresh and new. Great job! So fun hopping with you! Love it, Bre! That mirror gives me serious heart eyes. And how adorable is the seed packet bunting! Jasper looks like he has made himself perfectly at home. Such a cutie! Very pretty mantel Bre! I really like the mirrored window and that seed bunting. Your new puppy is adorable!!! We have a brown labradoodle too and they are the best!!! I love the simplicity of your mantel. And the seed packet banner is fantastic ( I do love seed packets). Also, the color of your walls is beautiful! 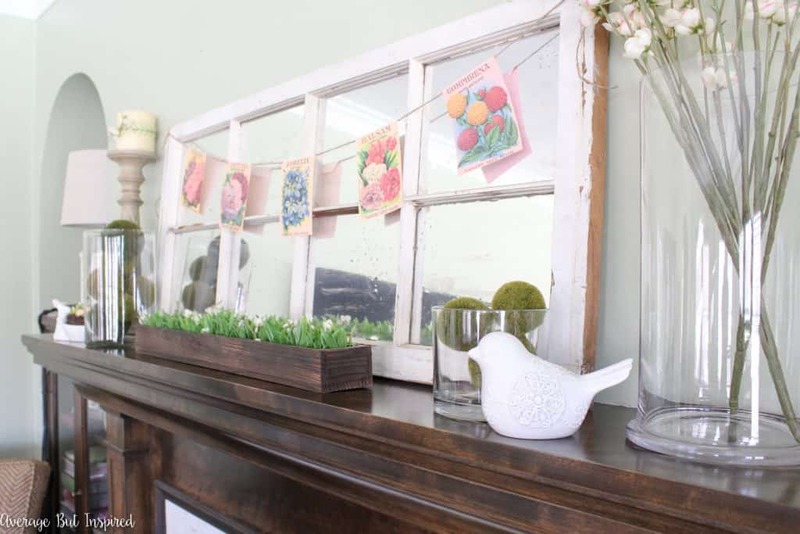 Your spring mantel is so lovely! 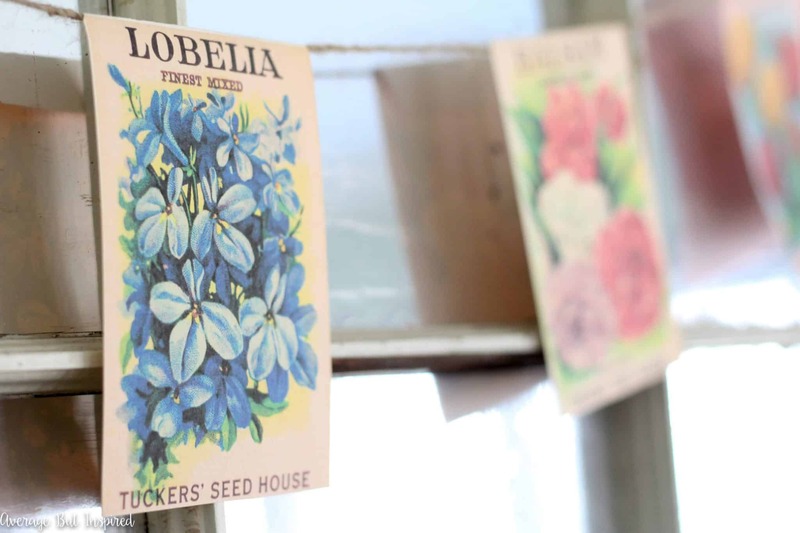 I can’t believe the seed packets are printables! That is awesome! 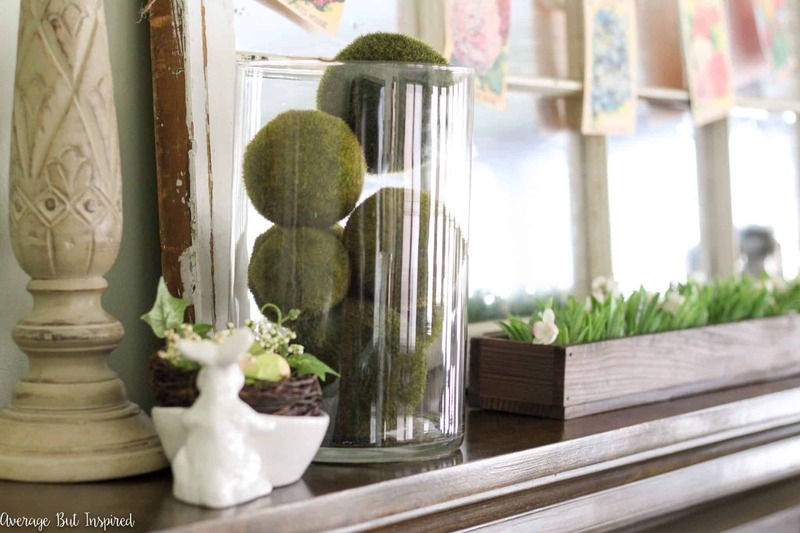 The little bunny and moss balls are perfect! This has been such a fun hop! 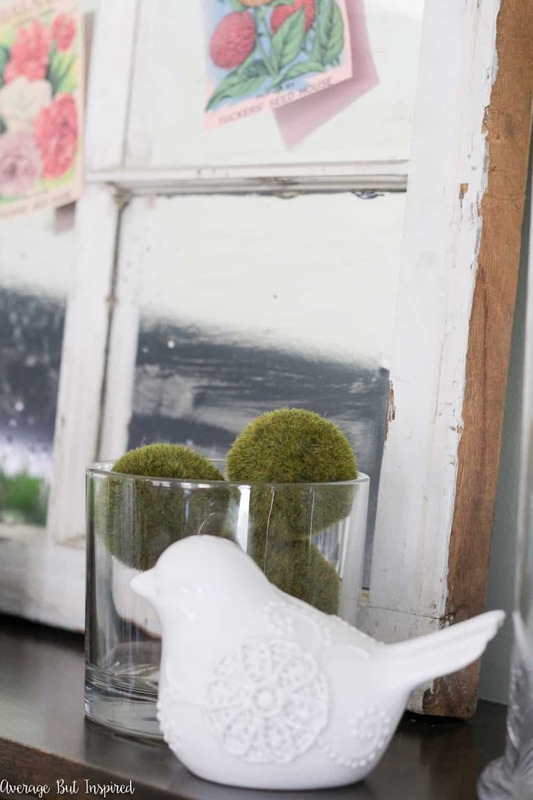 Love the chippy white mirrored window and the adorable seed packet bunting! 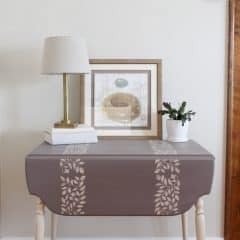 Such a smart idea to use a printable a different way. Who’s got time to hunt down antique seed packets anyway? You mantel is beautiful, Bre! I adore your seed packet banner & the ribbon and cherry blossoms you added to the candle – those little details make a huge difference in my opinion 🙂 And hello to Jasper! He is a cutie! I love this all! 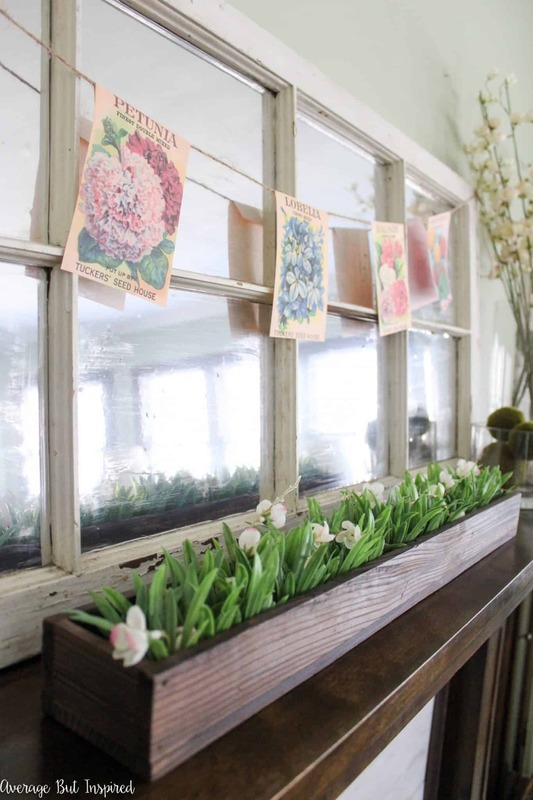 That window/mirror with the bunting is so perfect for spring! Great ideas and the garland is so cute!